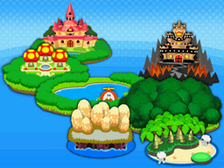 Plack Beach is a location from Mario & Luigi: Bowser's Inside Story. It is east of Cavi Cape and south of Dimble Wood. Bowser first comes through here in the beginning of the game. Bowser then meets Broque Monsieur, who is stranded on an island. 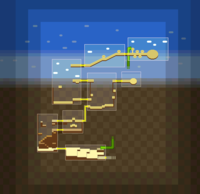 Bowser pulls the island to the main land with the unknown-to-him help of Mario and Luigi who stimulated his arm muscles. Broque rewarded Bowser with the Vacuum Block and taught Bowser how to use the Vacuum technique. Bowser then found and fought the Sea Pipe Statue that was brought to life by a Fawfulcopter. After the statue was defeated, he realized his fire breath was gone, and discovered that Starlow (who claimed to be named "Chippy") was inside his body. He then ordered Starlow to go figure out what was wrong. Starlow then sent Mario and Luigi to investigate. Mario and Luigi eventually made it to the Flame Pipe and fought the Scutlet that was blocking the fire's flow. Bowser then burned down the tree that was blocking his path, and met again with Broque. Broque explained that his dog, Broggy, was being disobedient and needed to be taught a lesson. Bowser battles Broggy and wins. Broque and Broggy leave, saying to visit them in Dimble Wood, where they own a shop. 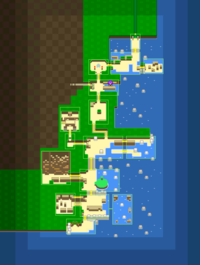 The area is later explored by Mario and Luigi themselves, meeting and solving puzzles for Kuzzle, (one of which rewarded them with the Spin Pipe attack) as well as battling Chakron and procuring his Star Cure. Many tooth-like structures with gray chips in them border the area. These chips give a plaque-like impression, hence the area's name. The fad Squid Fit first appeared here. 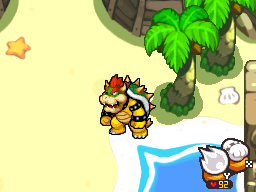 Here is a list of overworld items found in Plack Beach during the events of Mario & Luigi: Bowser's Inside Story. Additional items include the Retry Clock given by Broque Monsieur during the demo battle, Kuzzle's rewards, and those dropped by enemies. Ultra Mushroom In a ? Block in the third scene from Cavi Cape. In a ? Block in the fourth scene from Cavi Cape. Hot Drumstick x2 In a brick in the first scene from Cavi Cape. x3 In a brick in the fourth scene from Cavi Cape. In a brick by the fifth scene from Cavi Cape (with a tree in the center). In a brick in the scene to the right of the Sea Pipe Statue. Super Nut In a ? Block in the first scene of the cliff area. Max Nut In a ? Block in the scene to the left of the second scene from Cavi Cape. In a ? Block in the scene to the right of the second scene from Dimble Wood. Supersyrup Jar In a ? Block at the end of the fork to the west of the fourth scene from Cavi Cape. Ultrasyrup Jar In a ? Block in the second scene from Cavi Cape. Star Candy In a ? Block at the end of the fork to the west of the fourth scene from Cavi Cape. In a ? Block in the second scene of the cliff area. In a ? Block in the next-to-last scene in the cliff area. Refreshing Herb In a ? Block at the end of the fork to the west of the fourth scene from Cavi Cape. Big Stomp Boots In a ? Block in the scene to the left of the third scene from Cavi Cape. Flower Gloves In a ? Block in the third scene of the cliff area. Heart Wear In a ? Block at the end of the fork to the west of the fourth scene from Cavi Cape. Mushroom Gloves In a ? Block in the scene to the right of the fourth one in the cliff area. Blitty From Chuboombas. This Blitty can also be obtained in Cavi Cape. Puzzle Sacks See Puzzle Sack § Locations. Attack Piece x10 Given by Kuzzle for completing his first puzzle. Star Cure Given by Chakron at the highest spot on the cliff. Vacuum Block Given by Broque Monsieur as part of the storyline. There are 57 Beans in total. Area map of the cliff. Musshība Bīchi "Toothdecay Beach"; Musshība comes from mushiba, meaning "tooth decaying". French (NOE) Plage Kari-Kari "Kari" is pun on "carie" (dental cavities) and "plage" means "beach"
"Plack" is a phonetic take on the word "plaque," a sticky clear film composed almost entirely of bacteria that can cause tooth decay. This is due to the presence of cavity-ridden tooth-like structures scattered around the beach, as well as tooth/cavity based foes around the area (such as Chuboomba and Toothy). This page was last edited on March 2, 2019, at 20:59.